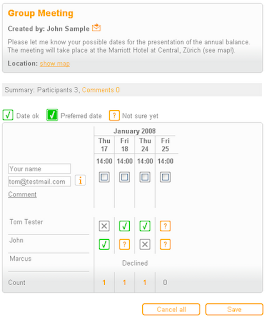 Morganize is a free organizational tool that has features for groups to work together. You can find the best date and time for a meeting, take polls and surveys, and even work with a shared To-Do list. It's free, no registration is required, and it's easy to use. Educators can use this to schedule study sessions, meetings, take polls and surveys of students or faculty and work on shared To-Do lists as part of student projects or school projects. These features exist in other services and systems, but Morganize is simpler and requires no registration or accounts.